Rueben and Dominique were amazing through the entire 7-month process of planning our wedding. Right from the first meeting, we could see how knowledgeable they are and felt extremely comfortable in trusting them to handle an event that meant so much to us. In fact, Rueben’s visualization of how our wedding could be laid out was a huge factor in choosing the venue. Rueben was always available for a quick call, text, or email as questions arose. Leading up to the week of the big day, Dominique ensured all vendors were on schedule with their pick-ups, delivery, set up, etc. Everything was set up exactly as we wanted it and part of this was due to their amazing floor plan website where we could literally see our wedding plan come alive. To walk in the day of and see it exactly how we pictured was amazing. We felt so comfortable with Rueben, Dominique and everyone on their team. Thank you so much for making our wedding day an event we will never forget. Blue Elephants did an incredible job on the day of our wedding. Reuben and his team were fabulous to work with and everyone raved about the food. Amazing attention to detail and quality of service. Thank you, thank you, thank you! I interviewed many vendors for my daughters wedding. In the end I selected Blue Elephant and was so happy I did. The entire team was very knowledgeable, responsive, and more importantly just nice people who really seemed to enjoy what they do - making one day special for the bride and groom! As a family, this was our first wedding and as the mother of the bride, I could not have done this without the continued support from Reuben and his entire team. Having said that, I'm a foodie and they are a caterer, the food was incredible! I had people coming up to me all during the wedding, "the food is do delicious and at a wedding...no one expects really great food at a wedding!" Value...their price point was spot on. You give them a budget, they will work with that budget. They have wonderful ideas on how to create very interesting menus for all budget, I was quite impressed. I have one more daughter and will be calling Reuben (hopefully in a few years) to help me! If your looking for someone to "really" take the time to understand who you are, the "vibe" you are trying to achieve, the money you have to spend, and then create a wonderful experience for your event...that is Blue Elephant! My husband and I loved working with Fausto. He had previously catered my sister-in-law's wedding and his food came highly recommended. We decided to also have him as our wedding planner and we are so glad we did. Planning a wedding from across the country was stressful, especially with 9 vendors to coordinate. We were not sure how it would all come together on the day-of but thanks to the Magic of Fausto, everything was better than we could have hoped. He made great recommendations on rentals that added lovely finishing touches to our venue. When one of our vendors dropped the ball, he stepped in to make sure everything would be perfect. When in rained up till the last minute before our ceremony, we convinced us to do the wedding outside anyways - which was absolutely the right call. His team kept everything running on time while being unfailingly polite. We are so glad we had him on our side on the big day. Great job, Fausto & team! Choosing to use Reuben and his Blue Elephant team was the best decision my husband and I made in regards to our wedding planning! Reuben went above and beyond our expectations and made our wedding day 100% stress free. Reuben was so accommodating with dietary allergies for our guests and made our entire plated dinner meal gluten and dairy free. Reuben coordinated with all of our other vendors to ensure our wedding day turned out perfect. I would recommend Blue Elephant to all my family and friends! When we started to look at venues for our wedding reception, almost every place we went to seemed to recommend Blue Elephant. When we finally chose our venue, we hired Blue Elephant immediately and we are so glad we did! Planning our wedding from Florida wasn’t easy, but Fausto was highly responsive and was always so accommodating to meet with us whenever we came to Maine. So many people commented on the delicious food for cocktail hour and dinner. Fausto is so knowledgeable and recommended all of the best vendors! Our day was perfect thanks to Fausto and his team. We chose Blue Elephant Catering for our wedding and it was the perfect choice! Not only was the food incredibly delicious (our guests are still talking about it), but the planning process with Reuben from the initial meeting to the wedding day was more than we could have ever asked for. Reuben’s attention to detail and organization over the wedding weekend (rehearsal dinner and wedding) was exactly what we needed. Everything went off without a hitch! I completely trusted him and his team to coordinate the day and they absolutely crushed it. From setting up the venue, owning the itinerary/schedule, to the impeccable food and service - they made our wedding day picture perfect. It was so great not having any worries throughout the weekend because of Blue Elephant. Highly recommend. 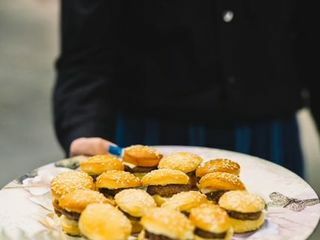 We recently used The Blue Elephant for catering for our June wedding at the Masonic Temple and they were the best. Truly incredible team to work with. They helped every step of the way from set up to clean up. They worked very hard to make my dream wedding a reality! Thr service and food was amazing as well. Couldn’t have asked for a better company to work with. Hiring Blue Elephant was the BEST DECISION we made planning our wedding. The Blue Elephant Catering team was a group of absolute professionals that were also a tremendous joy to work with. We can’t say enough about how much support we got from Fausto along the wedding planning journey. 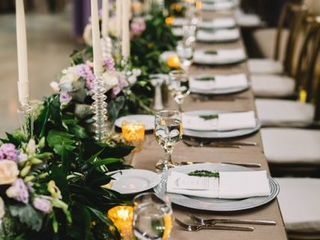 From help and guidance on wedding 101 basics, to tablescape design, to coordinating our vendors, to navigating challenging family relationships on the day-of, and to calming us down when we got too stressed. He’s a pro through and through with a sense of humor and great attitude to boot. He was additionally our day-of coordinator (which we can’t recommend enough) and everything on our special day exceeded our expectations, 10 out of 10 for every detail, we wouldn’t have changed a thing. If you hire Blue Elephant you will be putting your money and mind at ease and the event will go better than planned. It’s impossible to put into words how lucky we were to find Blue Elephant. Our wedding was perfect and Reuben and team are the reason why. Their food is amazing, their team is completely professional, and no detail is overlooked. Every guest raved about the food and service. They are simply the best in Maine. But the catering is just one part of what Blue Elephant does. From the moment we met Reuben he helped oversee all aspects of our planning and then coordinated ALL aspects of the day-of events—from the early morning setup to the entire ceremony and right up until the last guest left the property at 11pm. Nobody worked harder to make our day special than Reuben and his crew and we’ll be forever thankful for them making our day so perfect. And the most outstanding aspect of all was the level of confidence we felt working with Reuben and his team. Nothing rattles them and more than once Reuben made my anxiety disappear. They are total pros and they take almost all of the stress out of the process. And despite being busier than most people in Maine at any given time all wedding season, not once did Reuben find an excuse to avoid taking my call or text. In fact, he never showed the slightest sign of being annoyed—even when I probably totally deserved it. He was always pleasant and super helpful and never once complained about anything, ever. Reuben is just a gem of a person and you’d never know he’s a major player in the industry because of how humble he is. While I could go on, the bottom line is that I can GUARENTEE that if you hire Blue Elephant they will ensure your wedding is awesome and will make every single step along the planning process as easy as it could be. I just cannot say enough about how amazing they all are and how blessed we were to have them run our wedding. Do yourself a favor and book Reuben, Fausto and the Blue Elephant team immeadiately! And the value is unreal! Blue Elephant is by far the best catering company out there! There are no words to use that could truly express how grateful and amazed we are of the work done the team that was involved with our day! 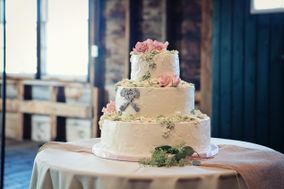 Finding a caterer for our wedding was such a headache until we called Blue Elephant! My Husband and I did not have an enormous budget and were initially told to avoid Blue Elephant because they were a high end company and probably wouldn't work with a smaller budget. That statement could not have been any more false. We were communicating with the wedding coordinator and we were not a fan of the initial proposal. Instead of instantly writing us off, she talked to the owners Reuben and Fausto (Amazing People) and they were able to offer us a new proposal, it was the best news that were received. My husband and I had such a great time at the tasting, the food was simply amazing! Kaitlyn went over every detail with us and made sure that she knew exactly what we wanted. She was so easy to work with and you can tell she loves what she does! It was also nice to meet with Reuben during our tasting. He made sure that we knew our day was just as important and special as clients that had double our budget. It's not just about the paycheck to them, they went above and beyond for us on our day! Kaitlyn and the team on our wedding day, were just simply outstanding!! She was able to make my vision come true! All of the planning and all of detail came to life. After all of our conversations, I had no doubt that our day was going to be perfect in their hands. During our cocktail hour, we were extremely surprised to learn that my husband and I had our own staff member, that was only catering to us for whole night. Anything we needed she was there, it was awesome!! This company deserves every amount of praise possible for the work that they do. I couldn't have asked to work with a better company for our special day!! HIGHLY RECOMMEND!!!! Reuben and Blue Elephant enabled what was, by far, the happiest day of our lives. We cannot praise Reuben and his team highly enough. They're far more than just a provider of (delicious!) food - Reuben acts as a wedding coordinator in his own right - he worked SO, so hard for us throughout the entire process. The catering team delivered 150 beautiful, delicious meals for our guests as part of a day that could not have gone more perfectly, thanks in large part to Reuben. Our biggest hugs and warmest thanks to Reuben and the whole team for everything. We give Blue Elephant our highest recommendation. Blue Elephant did such a wonderful job catering our wedding and the day after brunch! We had worked with Ashli for about 10 months and before we started working with Kaitlyn. The transition was painless and Kaitlyn did an amazing job catching up on all the details for our wedding. She stayed in touch via email (we were planning from out of state) about our vision and then executed it even better than we had envisioned it! Our wedding was held at a private residence and everything really had to be carried out by scratch. Since we were planning from out of state, we really had to rely on Kaitlyn for a lot and she really turned our vision into a beautiful and fun event. Everything went off without a hitch, and that was really due to Kaitlyn’s tireless work coordinating all of our vendors, as well as her own staff. She then arrived at a second private residence at 8am the next day for a brunch for all our guests (quiche and pastries). We got so many positive remarks from our guests about the food at both events and about Kaitlyn and her staff. We were especially grateful to have an assigned staff member who made sure we ate at the event. 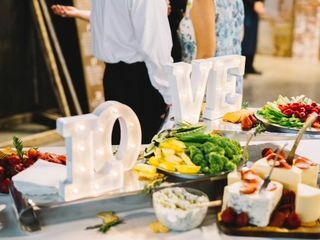 Wedding menu: lobster rolls, pulled pork and brisket sliders; appetizers: potato pancakes, chicken satay, caprese salad skewers + cheese and crudité station. It is hard to put into words just how much appreciation my husband and I have for Fausto and his team at Blue Elephant Catering. Going with Blue Elephant for our September 2017 wedding was a no brainer from the beginning. At our first meeting with Fausto, we felt welcomed like an old friend. He made us feel so excited about what was to come and had wonderful recommendations. Along with catering your event, they will also act as your day-of coordinator. This is an invaluable service, as it took so much of the stress and guess work off of us, allowing us to be fully present in our day. Fausto and his team were attentive, respectful, and professional throughout. He met with us on different occasions, and answered any silly question we had - even putting my mind at ease with a "Plan B" just in case it rained for our outdoor ceremony. The food was fabulous, with many of our guests saying it was the best they have ever had at a wedding. We were so lucky to have Fausto himself as our day-of point person, and I am forever grateful. From helping me with my veil and helping us cut the cake, to keeping vendors to our timeline and making my vision and DIY projects come to life before my very eyes, we could not have done it without his expertise. I will recommend them over and over again. Without a doubt, Blue Elephant is the event and catering company for your big event! Thank you Fausto and team! Also - a huge thank you to Mariah, part of the catering team, who kept our legs bug sprayed and cocktails in our hands all night! She was AMAZING! Where to begin with Blue Elephant? Before we even had a venue, we were booked with Blue Elephant - and it was the easiest, and most rewarding decision we collectively made. 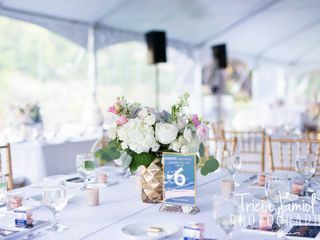 Blue Elephant is not just a catering company, but a full service event planning and production company, which is something they take great pride in and is evident in every little aspect of their work. Planning our wedding in Maine, from New Jersey, required that we find someone who was trustworthy, reliable, patient, and had as much energy as we did to make sure it was The Best Day Ever - and we found that person in Kaitlyn, a long-time veteran but newly promoted Event Producer who inherited us just four short months before our wedding due to an unforeseen staffing change. Lucky for us, she didn't miss a beat! Kaitlyn did so much for us and kept us on track every second of the way. She went above and beyond our expectations, picked up quickly on the exact vision we were going for, checked in on us regularly in the weeks leading up and more importantly, the day of the wedding, to make sure we had everything we needed and more. Her whole team was just outstanding the day of the wedding, and everyone from the servers to the owners of Blue Elephant were nothing short of a pleasure to work with. They somehow took all of the stress involved in planning a wedding, out of the equation. Everyone at our wedding was remarking on not only how professional and kind everyone was, but how amazing the food was. Another thing, we had requested a rather unique array of passed appetizers for our cocktail hour and we weren't completely sure about how they would be executed - Blue Elephant did it better than we even imagined they'd come out. All of our guests were raving about the quality and diversity of the food. 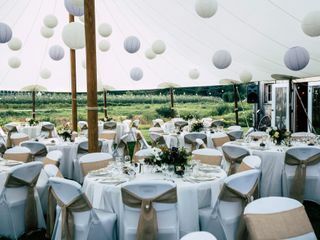 If you're planning a wedding in Maine and you're from out of state, not sure where to start - start here. You'll be grateful to have done so. We certainly are! Blue Elephant was the most accommodating vendor we had the pleasure of working with for our wedding. Ashli was our main contact person and also our day-of-coordinator (she does a lot of coordinating before the day-of, though!) and she is absolutely a gem. She's professional, patient, and overall wants you to be happy. I must have sent her the most emails with the most changes and questions throughout the wedding planning process, and Blue Elephant accommodated all of them. I can't even remember how many iterations of the contract we went through (because of us, not Blue Elephant) before we arrived at exactly what we wanted. We were given the freedom to design our menu and Blue Elephant executed it perfectly. The food was delicious, the service was great, they made the tables look amazing and provided props (included in the contract) to enhance our wedding experience even more. If there were bumps in the road, we didn't know about them, because Blue Elephant are true professionals with a tremendous amount of experience. And it shows! Thank you, Blue Elephant and especially Ashli for executing our vision perfectly and for guiding us through our wedding day with such patience and calmness. I'll never forget Ashli's reassuring hugs and smiles and how efficiently her team worked to set up the entire reception, even down to arranging loose flowers. Everything was perfect. Future brides: Blue Elephant is an easy choice. Look no further than Blue Elephant Catering if you want outstanding service, amazing food, and so much more than just catering! 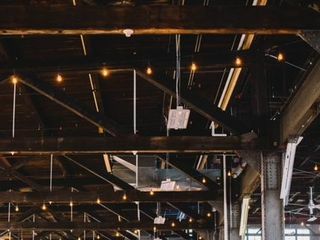 Reuben and Fausto were incredible to work with, helped us with planning many aspects of the wedding and making helpful vendor recommendations, and we have to mention their incredible warehouse full of props and decor items that they let us use free of charge! It is always refreshing to work with people who have a true passion for what they do, and it clearly comes across in their work. Reuben and Fausto delivered nothing short of perfection and helped make our dream wedding day come true. Fausto personally delivered us our first glass of wine to toast as husband and wife and assigned a wonderful server to make sure we didn't miss out on the delicious appetizers and that I (the bride) was well fed at the wedding! Don't miss out on the chance to work with this fantastic duo. My husband and I, our families, and the guests had nothing but glowing reviews. I was so happy that we chose to work with Blue Elephant Events & Catering for our wedding. We were planning our wedding from out of state and Reuben made everything seamless and easy. Not only did they provide us with a great space to have our wedding they also made sure that everything was on schedule and set up perfectly for our reception. I had a lot of items that were DIY that were dropped off a few days prior to our wedding and they were flexible to meet with me leading up to the wedding (even in winter weather). Not only were they flexible on meeting with me and keeping communication open over phone calls, texts, and emails they were also great on working with our budget. Because they are not jus a catering company and they are a full service events planning company they were able to work with vendors that they trusted and suggested vendor for us on everything from our bar, lighting, rentals and random specific request I had for decor. One great example of many was I had wanted large oversized balloons around the room of the reception hall, but the helium tanks I had purchased didn't fill all of them. Reuben went out of his way to have the remaining balloons filled somewhere else and perfect for the reception. Small acts of going above and beyond was something I was thankful to have on my wedding day. Not only was Reuben great the entire staff was very friendly and they even helped with guiding our guest from the church next door to the reception and bringing over sparklers for our exit from the church. One of the great things they also did for our New Years Eve wedding was create a special surprise for our guest by setting off confetti cannons at midnight! We had such an amazing time at our wedding and we truly owe it to the fact that we knew Reuben and his team were taking care of everything. Blue Elephant is a vendor that you can trust to be professional and passionate about what they do. I recommend them highly! Reuben has been great at Blue Elephant Catering, he has answered all our questions made time for drop ins and venue visits and is just all around very personable to your needs. We wanted to do a dessert of apple crisp not a cake, and he with out hesitation said that they could either make it or if we wanted to get it somewhere else they would make sure it was taken care of at the reception. They really work with your budget and help to cut cost, I really feel like they are not just trying to get your money. Our wedding is still a few months away but wanted to review this great place to ensure not forgetting!! Words cannot truly describe how appreciative we are of everything the team has done for us on our wedding day! Being a foodie snob from Boston, we were very pleased with the food and service. The team went above and beyond by agreeing to be the day coordinator; they assembled all my DIY projects, which was quite a few as I love Pinterest, just as I have envisioned them. They are totally worth every dime! A huge THANK YOU to Reuben, Fausto and the entire Blue Elephant team for helping to make our November Wedding at the Portland Company exceed our expectations! We planned our wedding remotely, so having someone on the ground that we trusted (Reuben) was critical. Before even signing a contract, he spent several hours on the phone as well as met us at a few venues that required vision. Though the official contract was for food (which Reuben and team executed flawlessly –we received many compliments) Reuben acted as a day of coordinator and central point of contact for our other vendors – all for no extra fee! He was at the reception venue very early in the morning the day of our wedding and supervised the setting of the tables and the table décor. The venue, including space for the ceremony, cocktails, dinner and dancing, was beautifully arranged, again with his supervision. Blue Elephants menu suggestions reflected our interest in farm to table cuisine. The BE team accommodated several food allergies, including a life threatening dairy allergy. The staff was extremely professional and friendly throughout the day. You will not be disappointed if you choose Blue Elephant! I loved working with Blue Elephant! Rueben and Fausto are great. They catered our wedding in Wolfe's Neck Farm and not only took care of the food (which was amazing) but helped with the decor as well. I can't recommend them enough!